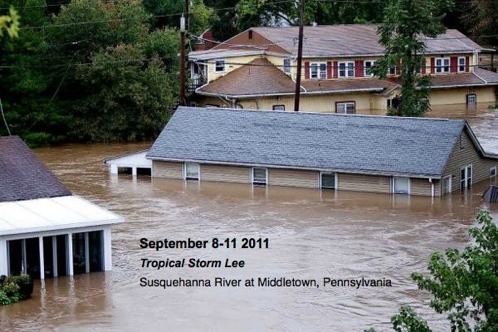 Since record-keeping began 200 years ago, the Susquehanna River has proven one of the most flood-prone watersheds in the nation. The watershed encompasses 27,510 square miles and extends from New York to Pennsylvania to the Chesapeake Bay in Maryland – where nearly 4 million people live. 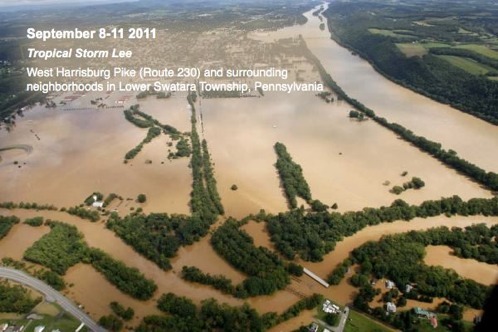 The main stem of the Susquehanna has flooded 14 times since 1810 – about every 15 years, on average. Even the Native Americans who once lived in the area told of frequent floods. February 1692 - Major flood of the Susquehanna and its tributaries. February 12, 1731 - Major flood of the Susquehanna and its tributaries. February 17, 1733 - Major flood of the Susquehanna and its tributaries. January 28, 1737 - Major flood of the Susquehanna and its tributaries. January 7, 1762 - Major flood of the Susquehanna and its tributaries. March 15, 1784 - Major flood of the Susquehanna and its tributaries. October 5, 1786 - Major flood of the Susquehanna and its tributaries, called the "The Great Pumpkin Flood" due to many pumpkins that floated away. October 1, 1787 - Major flood of the Susquehanna and its tributaries. April 1800 - Major flood of the Susquehanna and its tributaries. April 23, 1804 - Major flood of the Susquehanna and its tributaries. November 20, 1810 - Major flood of the Susquehanna and its tributaries. 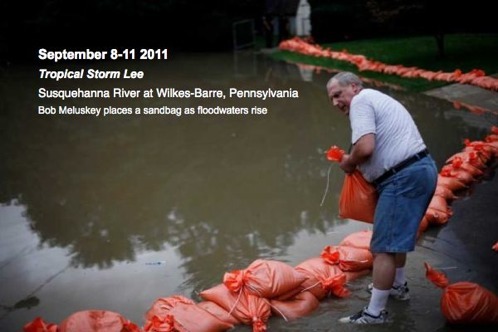 Also called "The Great Pumpkin Flood". 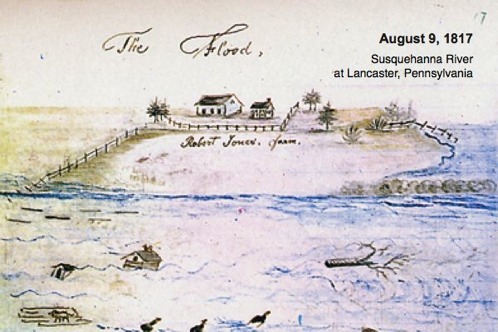 July 20, 1824 - Major flood of the Susquehanna and its tributaries. 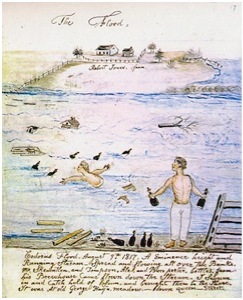 March 5, 1831 - Major flood of the Susquehanna and its tributaries. May 17, 1834 - Major flood of the Susquehanna and its tributaries. February 12, 1837 - Major flood of the Susquehanna and its tributaries. October 9, 1847 - Major flood of the Susquehanna and its tributaries. 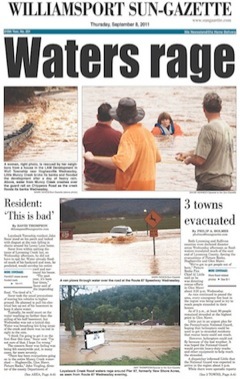 Flood destroys nearly every building in the township. Settlers suffering from hunger dispatch canoes to Dunnstown and Long Reach for flour and other provisions. 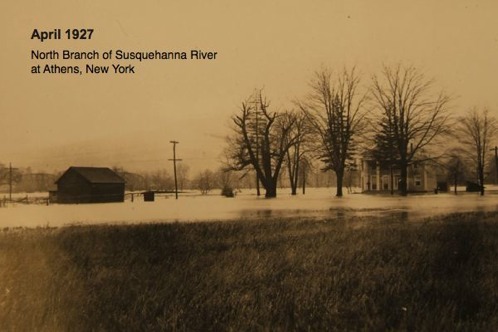 February 7, 1853 - Major flood of the Susquehanna and its tributaries. 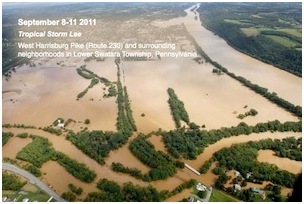 September 28, 1861 - Major flood of the Susquehanna and its tributaries. Flood ravages the valley after a log drive hangs up about a mile below the creek and torrential rain causes the river and creek to flood rapidly. Many buildings, along with rafts and logs, jam against the railroad bridge and sweep it away. Bodies from Sinnemahoning cemeteries rise from their graves and are swept by. 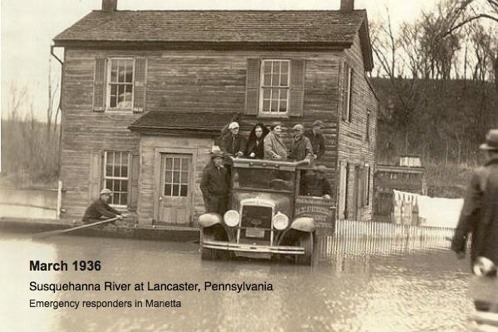 March 17, 1865 - Major flood of the Susquehanna and its tributaries, called the St. Patrick's Day Flood,[ carries away several houses and an enormous amount of logs and timber rafts. 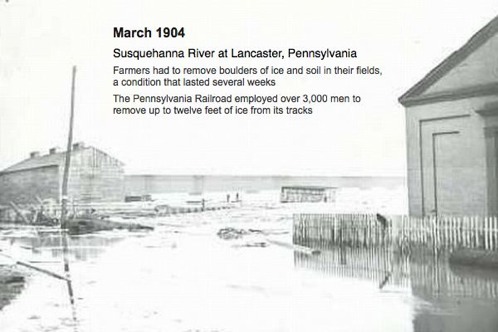 February 1872 - Major flood of the Susquehanna and its tributaries caused by ice breakup. 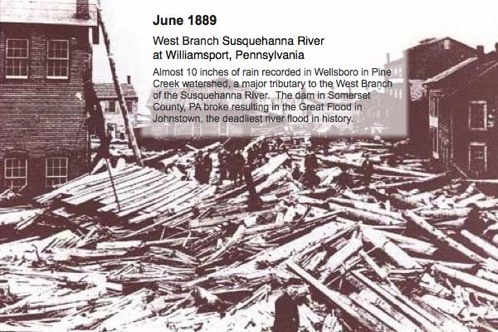 1894 - Major flood of the Susquehanna and its tributaries. 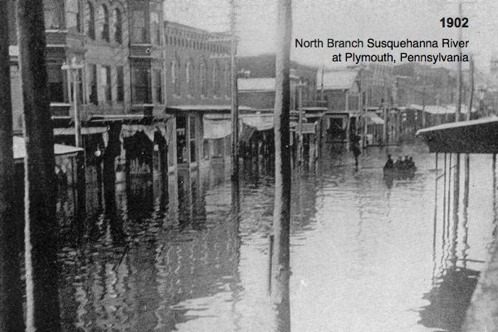 1902 - Major flood of the Susquehanna and its tributaries. 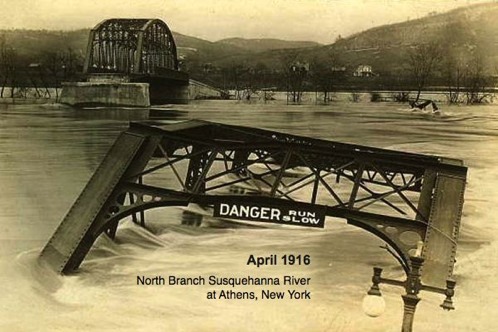 1904 - Major flood of the Susquehanna and its tributaries. 1910 - Major flood of the Susquehanna and its tributaries. 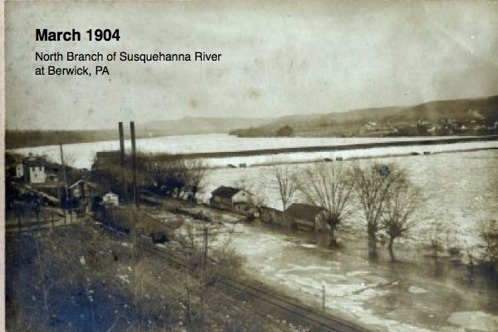 1927 - Major flood of the Susquehanna and its tributaries. 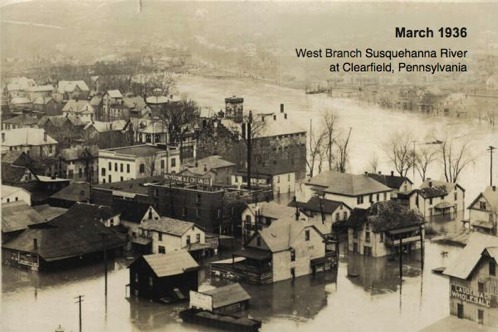 1946 - Major flood of the Susquehanna and its tributaries. 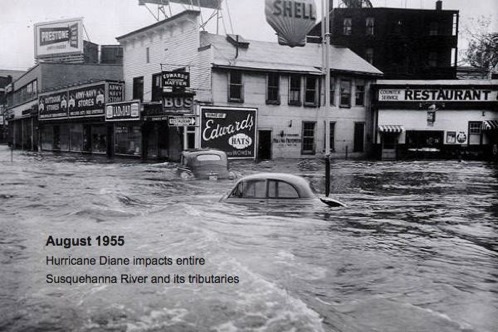 1964 - Major flood of the Susquehanna and its tributaries. 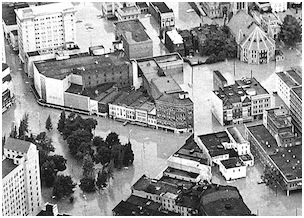 June 1972 - Major flood of the Susquehanna and its tributaries caused as Hurricane Agnes dumps 28 28,050 billion US gallons (106.2 km3) of water on the Susquehanna basin. Keating is flooded and the road bridge is destroyed. 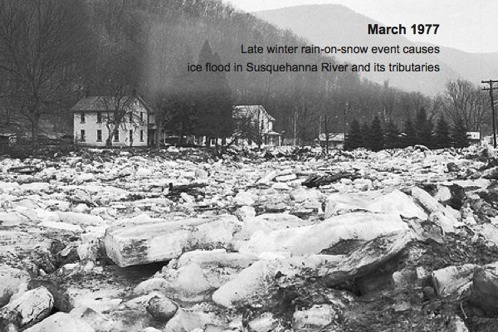 March 1977 - Severe ice flood in north central region of the watershed. January 19–20, 1996 - Major flood of the Susquehanna and its tributaries following melt of winter snowfall. 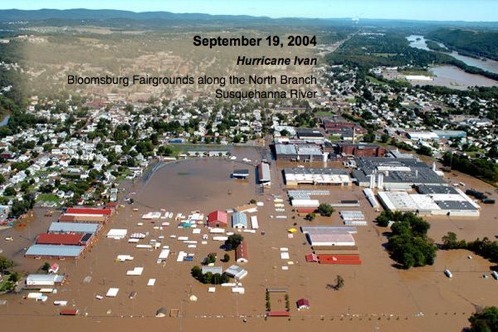 September 2004 - Major flood of the Susquehanna and its tributaries caused by the remnants of Hurricane Ivan. 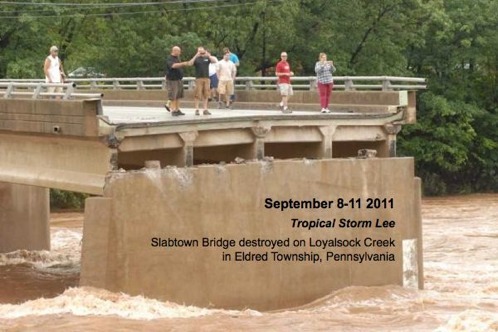 September 2011 - Major flood of the Susquehanna and its tributaries caused by the Tropical Storm Lee. 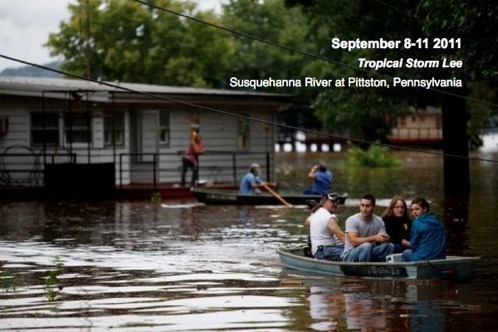 The Susquehanna Basin also is vulnerable to frequent, localized flash floods every year. These flash floods, usually affecting smaller tributaries, can occur with little advance warning. Tropical storm Agnes in 1972 caused the worst recorded flooding in the basin. Seventy-two people died and damaged topped $2.8 billion – about $14.3 billion in today’s dollars. Flood levels exceeded the record levels of the 1936 flood by as much as six feet in some places. It was the nation's most costly natural disaster until Hurricane Andrew hit in 1992 and Hurricane Katrina in 2004. Of the 1,400 communities in the river basin, 1,160 have residents who live in flood-prone areas. For these residents, flood warning and flood management and protection are of utmost concern. 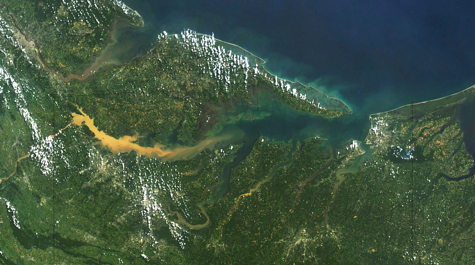 Satellite view: The sediment plume from Tropical Storm Lee and Hurricane Irene is clearly visible in this image taken by the Moderate Resolution Imaging Spectroradiometer (MODIS) on NASA’s Terra satellite on September 13. North is to the left. 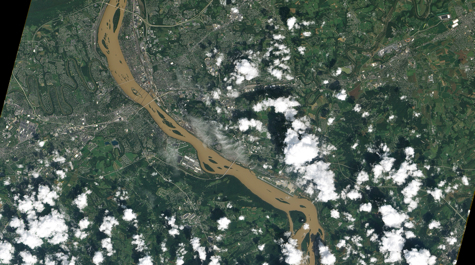 Susquehanna River: A satellite view of the Susquehanna River near Harrisburg, Pennsylvania, on September 10 shows the high levels of sediment that are being carried toward Chesapeake Bay. This natural-color image is from the Advanced Land Imager (ALI) on NASA’s Earth Observing-1 (EO-1) satellite. 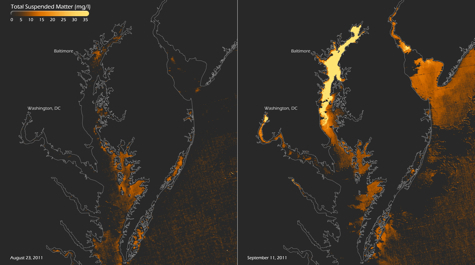 Chesapeake Bay Before and After: NASA's Aqua satellite captured these views of suspended matter (silt, mud, debris)in Chesapeake Bay before and after the passage of Hurricane Irene and Tropical Storm Lee. Image courtesy of NOAA CoastWatch. 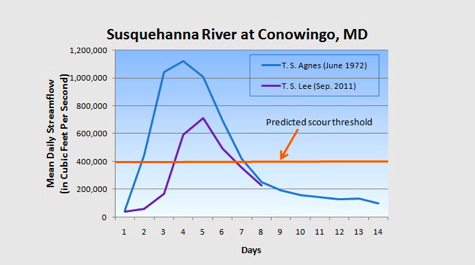 Susquehanna Streamflow: Mean daily streamflow for the Susquehanna River at Conowingo, Maryland, resulting from Tropical Storms Agnes and Lee. Image courtesy USGS. 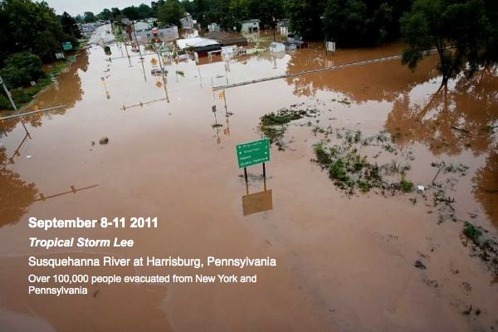 Irene/Lee Rainfall: Total rainfall from August 26 – September 9, 2011, as analyzed by the National Weather Service’s River Forecast Centers. 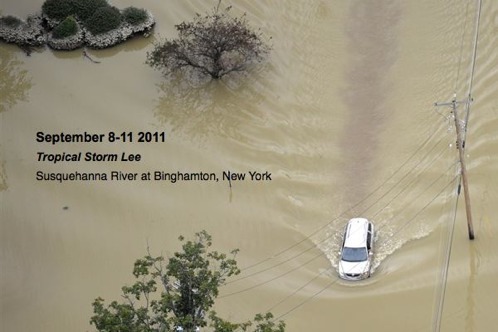 The largest rainfall totals, almost 3 feet so far, are seen in Northern Virginia through New York. Image courtesy of NOAA.